Have you ever purchased a new all-purpose vacuum cleaner that is electrically powered only to have it fail within a few months? Despite being called "industrial vacuum cleaners" these shop vacuums often can't withstand the dust, dirt or corrosion common to industrial environments. As a result, the motor or impellers seize up permanently. Compressed air operated vacuum cleaners can eliminate these problems and cost less than the electrically driven counterparts. Compressed air powered vacs have no motors or impellers to clog, wear out or break. They efficiently entrain surrounding room air to reduce air consumption, drawing the additional room air through the vacuum to create a strong suction suited to a variety of applications. 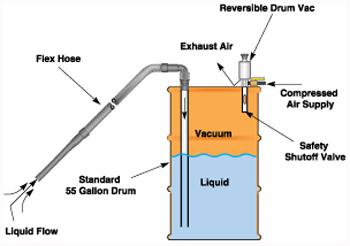 Chip Vacuum For Dry Materials – This chip vac mounts onto an ordinary 55 gallon drum and converts it to a high capacity vacuum cleaner. A filter bag is provided to keep the air clean of any dust, dirt and other contaminants. This chip vac picks up wet or dry chips, delivering them directly to a 55 gallon drum, and is 50% quieter than an electric vacuum. Its cyclonic action can be used to clean chips from fixtures, floors and work surfaces of all sorts. This chip vac is easily removed from the drum and placed on another, allowing you to keep materials separate for recycling. Vacuum Blow Gun – This hand-held gun is a lightweight vacuum cleaner, an air gun for blowoff, and a transfer tool all in one. A small removable insert that has directed nozzles determines whether the gun draws a suction for vacuuming lightweight materials or makes it blow airflow for blowoff, cleaning or drying. This transformation takes only seconds! This vacuum blow gun is low in cost, has no moving parts to wear out, is durable and safe, meets OSHA pressure requirements, and is lightweight, portable, versatile and quiet! Hole Cleaning Vacuum Gun – This hand-held gun is a low cost, lightweight suction tool for cleaning grooves, containers, and drilled, blind holes. A small diameter tube blows airflow into the hole or cavity to be cleaned while a large diameter tube draws a suction to carry the debris away. The amplified output flow is 12 times the air consumption rate, allowing it to use much less compressed air than an ordinary blow gun and making it much quieter. Reversible Two Way Drum Pump – This stainless steel, two way drum pump mounts to the top of an ordinary closed head drum to create a powerful liquid vacuum. A selector knob on the top determines whether the reversible drum pump will vacuum the liquid into the drum or pump it out and allows you to control the flow rate in and out of the drum. An automatic safety shutoff valve on the two way drum pump prevents spills or overfilling! This reversible drum pump is a safe, maintenance free way to recover coolant, hydraulic oils, liquid spills, sludge and chips, tramp oil and waste water, and fills the drum in less than two minutes!